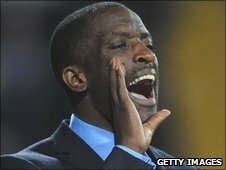 Charlton Athletic boss Chris Powell believes the Football Association is doing nothing wrong in its approach to encouraging black managers. Powell, currently the only black manager in the Football League, dismissed criticism of the FA over the perceived failing. He told BBC Radio Kent: "People will always look for someone to blame. "I've come through courses run in conjunction with the FA, but I still feel it's up to the individual." He added: "The FA obviously wants more players of ethnic backgrounds to apply for jobs but it will take time. "I obviously recognise the importance of my role, but I don't think you can always blame governing bodies - I think it's always quite easy to do that." The issue has been in the news following the departure of Paul Ince from Notts County last week. The fact that Powell is now the only black boss left in the Football League led the Sports Minister Hugh Robertson to say it was "further proof that football is the worst governed sport in this country". The chief executive of the Professional Footballers' Association, Gordon Taylor, has suggested that a possible solution would be to introduce a new regulation modelled on the American National Football League's "Rooney Rule" (named after Pittsburgh Steelers owner Dan Rooney), which requires all teams to include at least one ethnic minority candidate in interviews for senior management posts. But Powell said it was up to individuals to push themselves forward for the top jobs.